There weren’t a lot of parties or fun at our house in 1999 or 2000 but we tried to make up for it. On the first, third and eight anniversaries of E’s heart transplant we invited anyone who had helped us while he was sick. The family who brought potatoes from their farm, the many who drove our kids to sporting events or fed them while we were at the hospital. The women who slept with me at the hospital during and post surgery, the neighbours who ignored the falling down fence for another year, the co-workers who called, the prayers, the friendship .. the comfort and support.. We invited them all and we partied. There was a favorite greek restaurant in town. I called the owner and hired one of his best dancers to come and entertain the gang. After E, my 80-year-old mother danced with the belly dancer. My 13 year old son was next. Not many women hire a belly dancer for their husbands first birthday. Over the years at that house we had three graduation parties for over a hundred, family reunions and a celebration of life.. The house was made for parties and as our neighbours can attest.. There were a lot of them.. Life is too short and you always need to find a reason for a party. Small Frey showed up this morning and I saw him catch a herring beneath me. His Mom and Dad were also around all day. This afternoon Dad (Walsh) caught one in the same spot. They mostly hang out at the C&R’s but then they swoop down and fish right in front. 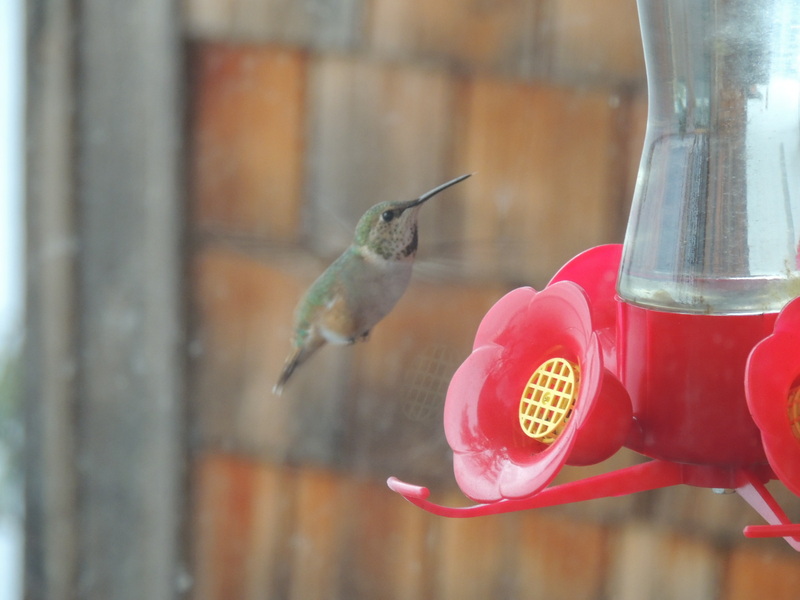 With all of the excitement of the herring and dolphins yesterday I forget to mention the return of the humming bird. I would suspect he is just visiting because the Y’s are away, but he is welcome none the less. We are fortunate to have you in our island community. I love these posts, so happy to have you guys as our neighbors ! Happy Anniversary Tinman !